Facebook constantly expands its advertising offerings by introducing new features to accommodate advertisers in their effort to make the most out of their platform. Whether it is creating ads that tell the brand’s story with carousel ads, immersing users in their brand’s world with Canvas or Stories ads, or cutting down the time to create creatives while at the same time tailoring the ad to the ad viewer with dynamic ads, Facebook wants to ensure that it gives advertisers the tools to drive results across its platforms. In a world where personalization is vital to make experiences more engaging, Facebook Ads are no different. Advertisers need to customize their offering, ad copy and ad creative to ensure the best experience possible. A great experience tailored to the user’s needs hopefully equals higher engagement — or, in terms of Facebook advertising, conversions. One way you could promote your products to potential customers before dynamic ads were available was to create a single image or carousel image ad and guide people to specific product pages on your website. But if you were a business with a large inventory to promote, you needed to create as many ads (creative and links to product pages) as your products. And if you wanted to tailor your ads based on where they are on the marketing funnel or the actions they performed (e.g. they viewed or added to the cart a particular product), then things could become really complicated really fast. Dynamic ads (or dynamic product ads as they are formerly known) allow advertisers to not only automate this tedious process but also create highly personalized ads that promote products with up to date information. A potential customer visits your site and browses through your products. Facebook, through the Pixel, will pair products and users and ‘take notes’ on how they interacted with them. When you create a dynamic ad you can include everyone that exhibited the same behavior, bring them back to your website by displaying the very same products each user engaged with using accurate and updated information available in the product feed. This how dynamic ads can help your visitors to complete the transaction. A business manager: This serves as a big folder where all of your assets (Facebook page, Ad account, Pixel, and Dynamic ads-related assets mentioned below) will be organized. Product feed(s): This is the file where all your products and product information will be stored. Product catalog(s): This is where your product feed is hosted. Dynamic ads are a powerful offering that can be used across a variety of verticals. Currently, dynamic Facebook ads are available to businesses that sell products (ecommerce), hotel, flight, destination, and home listings. Your business type will dictate the events (standard or custom) you need to implement. Here are the typical standard events needed for ecommerce businesses. You can add as many events you need to align them to your funnel. Once you have the events implemented, you need to create the feed. Facebook requires Facebook advertisers to list all of their products in a file following a specific format. This file is the product feed that will feed the products to your catalog. Depending on your ecommerce platform, you may need to create a data feed using a .csv, .tsv, or .xml file or a third-party feed provider to facilitate this process. Be sure to test your feed with Feed Debugger to ensure that your feed is set up correctly and fix any issues that may arise. Now, we can create a product catalog. Visit Catalog Manager in your business manager and choose the type that best describes your needs. Name your product catalog and click on the ‘Add Products’ button to upload your product feed. Next, choose how you will upload the data (schedule or a one-time upload) and insert the URL of your product feed. When done, go to the ‘Diagnostics’ tab to check for any issues, if you have done so with Feed Debugger. Now, that your product catalog and product feed are all set up, we can move to the exciting part; creating the dynamic ads campaign. To create a dynamic ads campaign, head over to Ads Manager and choose ‘Catalog sales’ as the campaign’s objective. At the ad set level, create a product set. The product set is a subset of your product catalog, and it contains the products that will be displayed through this campaign. 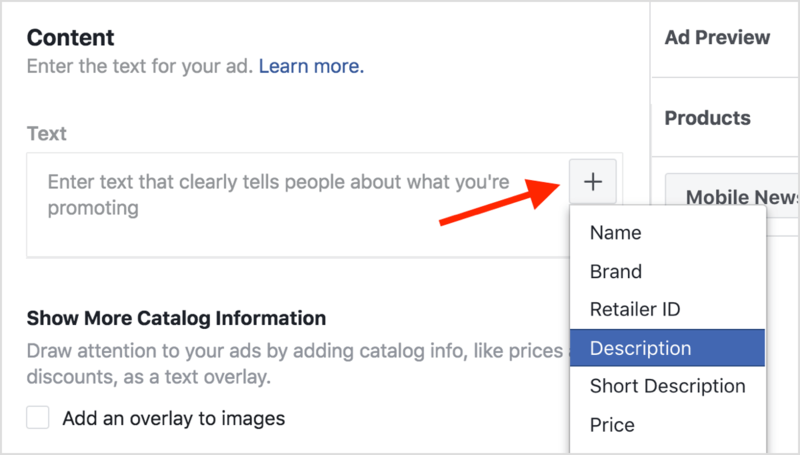 Next, in the audience section, choose ‘Define a broad audience and let Facebook optimize who sees your products’ so you can reach new people (prospecting campaign). To remarket to existing visitors, use the option “Use info from your Pixel or app to create a retargeting audience “. Scroll down below the connections menu and click ‘Show Advanced Options’. Here are some options that let you refine your audience and exclude people who are less likely to take action, such as someone who has already visited your website or bought from you. Next, you want to optimize for the right event type. Choose the event that you want to optimize for (View Content, Add To Cart, or Purchase) and set the conversion window to one that suits your needs. Be sure to fill in any other information (i.e. targeting, budget, etc.) the way you usually do. Now, we will create the ad. When choosing the ad format (single or carousel), take into account the type of images used in your product feed. Typically, landscape images will look great with the single image ad format while vertical images will look better with the carousel ad format. Now for your ad copy, you don’t need to manually insert the product name, description, or any other product information. You can use the ‘+’ button inside each box to pull a catalog field from your product feed. For instance, click the ‘+’ button in the text field, and select ‘Price’ from the drop-down list. There you have it. You’ve successfully created your first dynamic ad. As mentioned previously, dynamic ads are currently available if you promote products, vehicle, flights, destination, or home listings. If you don’t see your business type here, don’t get discouraged as dynamic ads can be used for all verticals. Here are some examples of using dynamic ads creatively. When using dynamic ads to promote your articles, the articles serve as products, and all product info will be the article’s information. For example, the product id will be the article’s id; the product description will be the article’s description and so on. Have in mind that you don’t need to rename the product feed’s, only the contents of it. Promoting your articles this way, allows you to save time and automate a tedious process. Plus, you can easily choose whom you will target; new or existing audience. To use dynamic ads top promote betting services, we substitute the products for matches/games and take of advanced product feed offerings by changing product availability based on time. Since matches are time-sensitive, we need to ensure that no match would get advertised after the betting period has ended. Although these are just two cases, dynamic ads can be used for the majority of the verticals out there. In an endless newsfeed where a majority of the ads look the same, you should create and apply custom templates to your dynamic ads to help stand out and grab your ad viewer’s attention. Depending on the period you are advertising in you can create Christmas, Valentine’s day, Black Friday inspired templates. You can also create “evergreen” templates that include your logo and your brand’s colors. Recently, Facebook released two new features that help you target your ideal audience within a country where many languages are spoken. Creating multi-language dynamic ads is very straight forward. Set up the dynamic ads campaign the way you normally would, and use the ‘Create in Different Languages’ option. Have in mind that this will only change the ad’s copy, not the information that comes from your product feed. If you are promoting your products across countries that have different currencies and you need to tailor product information to the language of your audience, then you need to create additional feeds that will include currency information (one feed) and country/language information (second feed). Both secondary feeds can be set up in your Catalog Manager. If you are targeting an international audience consider tailoring your ads to match their language. The chances are that your ads will convert better. A secondary feed that holds information on different languages will look something like the above screenshot. You need the product id which uniquely identifies your product, then state the overrides for each country-language combination and provide the all necessary product info for each language. For currencies, you will work similarly. Provide the product id, the country and the price in the country’s currency. The slideshow dynamic ads format helps display your products to users from different angles, including close-ups, without users having to click on the ad. This way, you bring the web experience straight in the users’ NewsFeed. To create Slideshow Dynamic Ads you only need to include multiple images of the same product in the feed as opposed to only one and check the box ‘show when available’ under ‘Catalog Assets’. Facebook Dynamic ads are a great advertising solution and should be part of your online advertising strategy. They allow you to automate ad creative creation, tailor your offering to your ad viewer and optimize for success. When done correctly, Facebook dynamic ads can help achieve your KPIs and make more bang for your buck.